Even though it was a classic image in movies and TV I never actually had spaghetti and meatballs as a kid. Apparently my brother and I had some sort of aversion to spaghetti sauce. My mom would make a traditional dish for her and my dad and set some noodles aside for the kids. We would then eat the noodles with a little butter and parmesan cheese. Weird. What did he expect if they left the ‘s’ off the menu entry? I’d like a doggie bag please. I never did much care for meatballs. 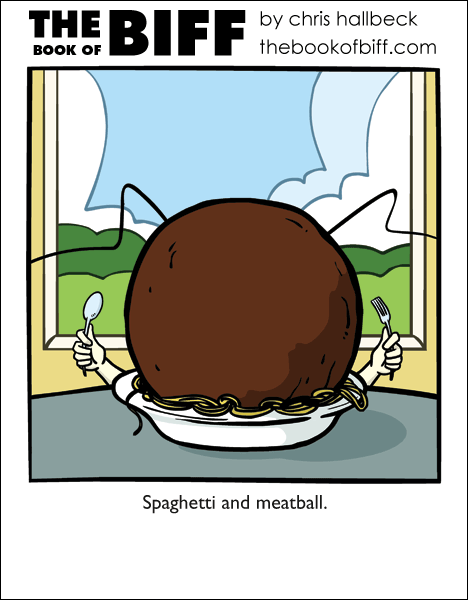 I’ll have the meatball dinner with a small spaghetti on the side. My kids eat spaghetti with no sauce all the time. Just butter and cheese. They have genetically superior arteries. Ah, plain noodles with butter and parmesan. That was a staple of my sister and my diet as kids. Mom calls the “naked noodles”. I’ve since started eating it with sauce after getting sick from the butter one Christmas, but my sister still insists on eating them that way. Came to your comic from that guest strip you did for Steve Napierski over at Dueling Analogs. I’ve spent that past few months reading through the entire archive, love the comic, keep up the good work. Also, Spaghetti has always been my biggest weakness. I was fasting for 3 days and almost made it the entire three days, but on the last night my mom made spaghetti for dinner…My resolve vanished in and instant. My dad makes the best traditional spaghetti sauce, though it’s never with meatballs. It’s either Italian sausage (very spicy) or ground beef. I certainly never had an aversion to sauce, but my best friend ate it with butter and cheese instead of sauce. @reynard61: Would I be correct in thinking “It’s-a him! Mario!”? @Trypno01 – Thanks for stopping by! Those pesky noodles always got in the way of my meat sauce. At our restaurant (I’m a line chef), we actually serve a pasta and meatball dish. Our meatball is impressive, but Biff’s still wins. Ok, does ANYONE remember this Saturday Morning Cartoon back in the early 80’s where there were traveling musicians, and the guy was named Meatball and his girlfriend was Spaghetti (and then a third guy I can’t remember his name)? Circa ’82 I think. That’s how I still eat mine. Noodles with butter and parmesan. I guess we weren’t as weird as I thought. Holy carp, I’m hungry now. I always salt my pasta water and put a little extra virgin olive oil on after cooking. Not only does it make them good with or without further condiments, it keeps leftovers from them turning into an un-appetizing cake of pasta goop. That’s how I ate my spaghetti as a kid, I wasn’t willing to try the sauce. I ate my spagetti with just butter and salt. When I was a little kid, my parents ate regularly at one Italian restaurant, and when they took me, the waiters knew to serve me spagetti in “butter sauce” with one softball-sized meatball. Nope, but they share the same source. I didn’t eat meatballs ’cause my family didn’t eat beef. I didn’t like sauce either; I’d always have tons of cheddar cheese all over my noodles. Mum usually makes her own meatballs (minced meat, diced onion and egg to keep it all together) but ours are small ones. Mum also usually makes her own spaghetti sauce – she has problems with reflux so we have to avoid most of the store-bought ones. They’re usually really good, but I’m not a huge fan of pasta in general (except maybe gnocchi). I was trying to think of some variation of that Alka Seltzer commercial, but your response was perfect. I wasn’t even around for the original commercial showing. It’s just that classic a commercial. In fact, I’m surprised nobody got it! My partner and I must be the truly weird ones – we eat our spaghetti with butter and parmesan… AND with spaghetti sauce! Which way we have it depends mostly on what we’re in the mood for. The shock, the horror. We like both. I know, we must be sick in the head. also: HAPPY BIRTHDAY BOOK OF BIFF!!!!! I used to do the same thing! I still do that to this day, sometimes. Mmm butter and Parmesan pasta. Spaghetti with butter is awesome! Parmesan cheese is nasty, though. My sister eats it that way, but I stick with butter and salt. Spaghetti with butter is awesome too. I used to eat it with tomato sauce until I became allergic to tomato. I actually got sick of eating pasta after three months of eating it when I had a stomach bug. I lost some weight when I had that bug. I always perferred plain buttered spaghetti over spaghetti with sauce as a kid, too. I get a little bit of sauce and some sour cream, diced tomato and shredded cheese. its reeeeaally good. my step mother makes it with one can of red sauce and one can of alfredo and thats pretty awesome 2.